18 months ago, injectable estrogen at the 40 mg dosage—the highest dosage and the most frequently prescribed to trans women—went on shortage and never returned to market. On a recent afternoon at Callen-Lorde, the LGBT community health center on Manhattan’s west side, a half dozen trans women waited anxiously on line at the prescription drop-off window. “We’re only point one percent of the population. How could they run out?” one woman asked aloud. “I’ve been on injectables for 16 years. I started my transition on injectables. This is not good,” said another. The United States is in the quiet grip of a national shortage of two drugs administered to trans women that medical providers call “life-saving.” Earlier in the summer, doctors became aware of increasing difficulty securing Delestrogen and its generic counterpart, Estradiol Valerate, at the 20mg dosage, both injectable estrogen hormone therapy used by trans women. Then, in mid-July at Callen-Lorde, none arrived in that week’s drug shipment. Pharmacists were told by suppliers the shortage will last until at least October. Some doctors who treat trans women are skeptical of the October date. Injectable estrogen is manufactured in three dosages: 10mg, 20mg, and 40mg. 18 months ago, injectable estrogen at the 40 mg dosage—the highest dosage and the most frequently prescribed to trans women—went on shortage and never returned to market. Doctors have made due since by prescribing doubled-up dosages of the 20 mg injectables. While the 10 mg dosage remains available, most doctors won’t prescribe it. The process involves injecting such a large volume of liquid into a patient’s muscles every one to two weeks—four times as much liquid as they were administering with the 40 mg dosage—that it can be extremely painful for patients, according to Anthony Vavasis, director of medicine at Callen-Lorde. For now patients at Callen-Lorde and across the country are being prescribed estrogen pills or patches. 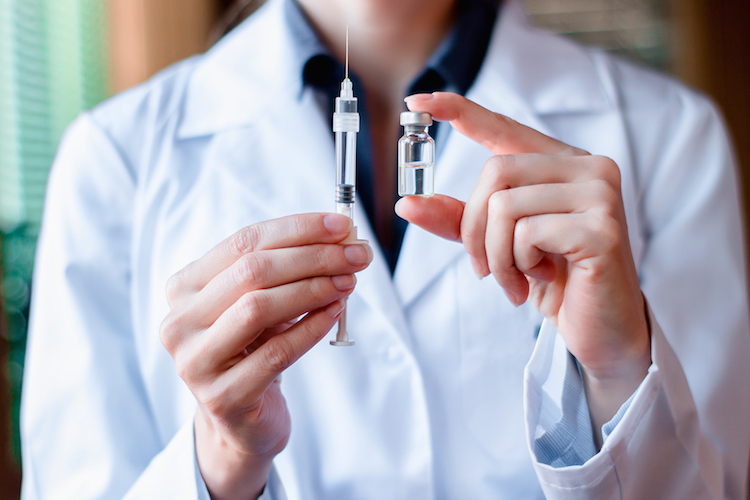 Although the medical community can’t point to any significant benefits in using injectables over other forms of estrogen therapy, many patients swear by them, claiming more benefits and a smoother transition when using injectables. According to Heather Zoumas Lubeski, a spokesperson for Par Pharmaceuticals, which manufactures Delestrogen, the company was forced to find a new manufacturer after its original supplier stopped producing the material. Par is awaiting FDA approval on the new drugs. “They have batches manufactured (10mg, 20mg and 40mg) but cannot distribute until they receive FDA approval. Once that happens, they can begin to ship immediately,” she wrote in an e-mail, adding that information was not available on how long the Food and Drug Administration approval might take. Perrigo, the company that manufactures Estradiol Valerate, did not respond to requests for comment. Vavasis says the issue goes beyond one of individual care and sees the potential of a public health crisis should the scarcity persist. Charlene Incarnate, a Brooklyn-based performer, was taking weekly injections of the 20 mg dosage. The shortage only affects the domestic U.S. market. The FDA prohibits such drugs from being imported. On the black market these drugs might come from other countries, like Germany or Canada, and ordinarily be safe, except dealers are known to dilute or add other ingredients, some potentially harmful, to increase their bottom line. The shortage also appears to be context-specific to the trans community, or cis women on fertility treatment. Menopausal women, according to Vavasis, most likely would not be prescribed estrogen injectables in dosages as high as 20 or 40 mg.
Incarnate calls injectable estrogen for hormone replace therapy a “matter of life or death,” particularly for trans women who’ve undergone sexual reassignment surgery.